Born covered in black feathers, abandoned as a baby in the slums of the Maze, Poe has lived his entire eleven-year-old life hidden away under the protection of his adoptive father, Gabriel. He spends his days secretly helping the Mice, bands of orphans who roam the slums, but there is a whisper of an altogether more sinister figure in the shadows, making street children disappear. When Bianca, an over-protected girl from the wealthy City beyond the Wall, escapes into the Maze in search of adventure, their worlds collide. As danger looms on all sides, a friendship grows between the city girl and the boy covered in feathers...a friendship that may just be enough to bring Bianca home, and lead Poe to his destiny. 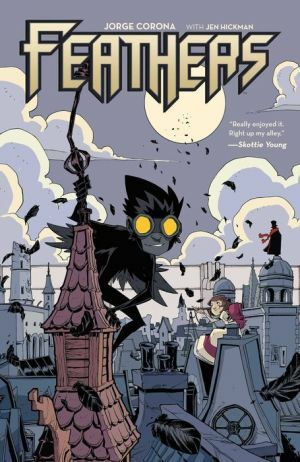 Created, written, and illustrated by incredible breakout talent Jorge Corona (Teen Titans Go!, Goners), Feathers is a heartwarming tale of danger, friendship, and adventure.